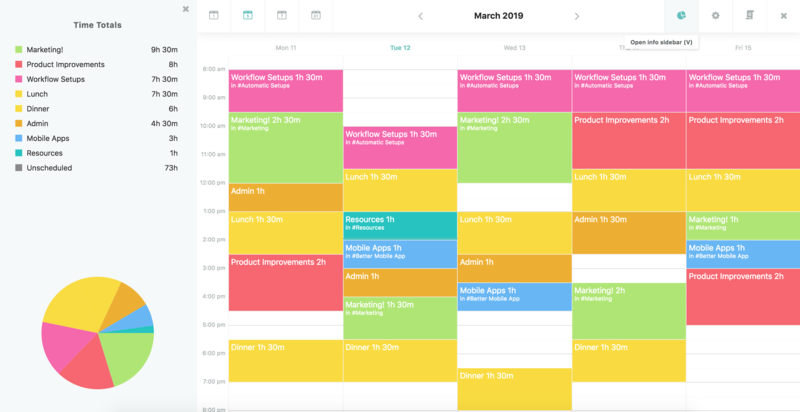 Time blocking is a productivity strategy where you block out chunks of time in your calendar for specific activities. It is not the same as scheduling specific tasks onto a calendar where you would schedule a task like "Fill out form A-20" to do at 9:00 on Monday. But instead you might reserve Monday from 8-11am for "Paper work" and Tuesday from 1-5pm for "Marketing". To add a time block open the controls sidebar by clicking "C" in the calendar or clicking the button in the top right. If you are about to set up lots of time blocks, using a simple click to add them is easier. Also make sure the "Show Time Blocks" is enabled or you won't be able to add them. Click where you want your timeblock to start and add the title for your timeblock. Then adjust the size to determine the length of the timeblock. Most often a timeblock shows up multiple times in your week. Instead of creating them over and over, you can copy them by holding shift and dragging them to another place. 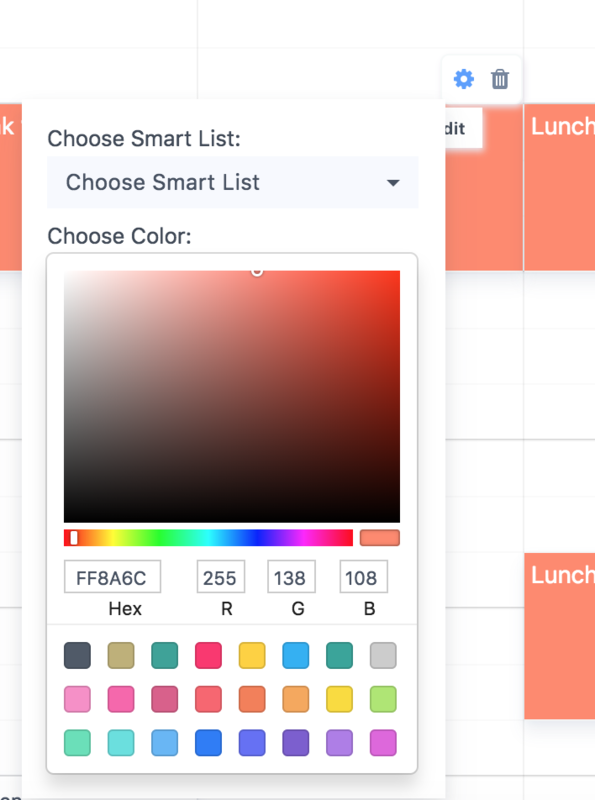 Once you created a time block (gave it a name, color, icon and assigned it to a category/Smart List etc.) you can re-use it by simply using the same name for another timeblock. This means when two timeblocks have the same name, they are the same timeblock. If the name of the block corresponds with the name of a main category, the color will automatically be taken over. If you want Marvin to understand what a timeblock means, you can connect it to a category, project label or Smart List. To resize a time block hover over it and click the little indicator at the bottom middle or top middle. Drag the timeblock to the correct size. You can move a time block by hovering over it until a hand cursor appears and then clicking it to drag. You can delete a time block by hovering over it and clicking the trash icon at the top right. You can save timeblocks for an entire week by opening the controls sidebar (C or button on the top right) and then clicking the "Save Week Template" button. 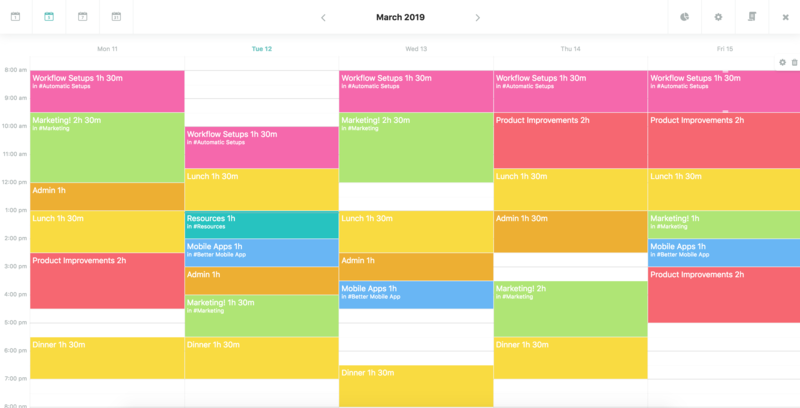 Once you have your basic time blocking schedule you can take it a step further (depending on your workflow) and schedule specific tasks or time to work on specific projects into your time blocks. To do this, turn on the time blocking sections strategy. 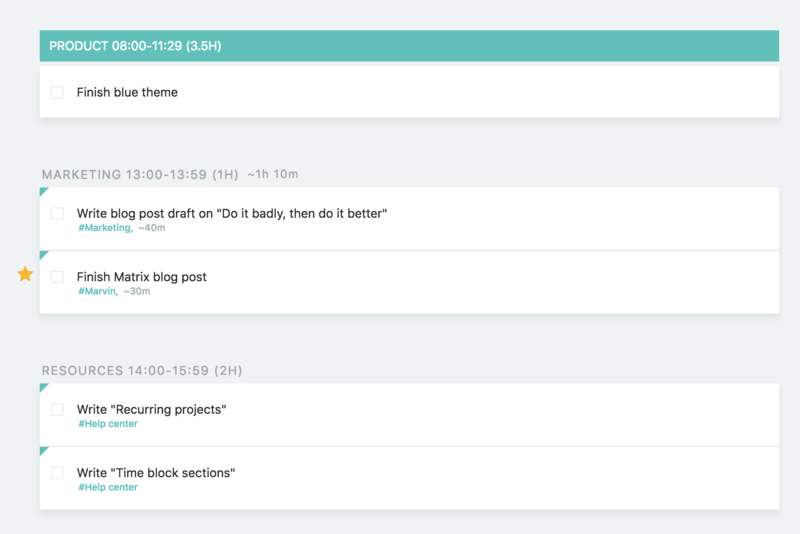 This will automatically section your day view by the time blocks of your day. Each time block section has a name, the timeframe for this block and the total time. The total time is helpful when using it in combination with duration estimates so you can make sure you schedule the right amount.